The Baltimore Sun Co. has signed a “voluntary recognition agreement” with a union to represent journalists at nine community newspapers, paving the way for contract talks between the parties. The Washington-Baltimore News Guild will be the bargaining agent for about 50 full- and part-time news and editorial staff of the Capital Gazette in Annapolis, Carroll County Times and The Aegis, Towson Times, Maryland Gazette and other publications under the Baltimore Sun Media Group banner. 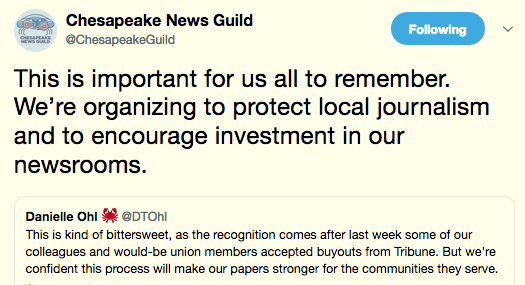 The union, which brands its organizing drive as the Chesapeake News Guild, says it has secured authorization by a majority of editorial employees as their collective bargaining agent. Two of the key issues are low pay and lack of job protection. Reporters told The Brew last month that yearly salaries at community papers range from $30,000 to $35,000 with no guarantee of raises regardless of seniority. “I know people who love this job, who love local journalism, but left because they want to buy a house or they are pregnant,” said one journalist. Another said the guild hopes to close some of the pay gap between community reporters and the staff at The Sun. Increased investment in local publications by the Tribune Co., owner of the Sun Media Group, is another priority of the union. Sun Media acquired most of the papers in the 2012-14 period after it had shuttered its county bureaus that once competed with the local publications. The fear of “news deserts” spreading across Maryland as a result of business decisions made by a conglomerate in faraway Chicago became tangible when Sun Media acquired – and, three years later, closed – City Paper, an alternative Baltimore weekly dating back to the 1970s. Looming in the background of this week’s recognition of the guild is the threat of more newsroom layoffs across the Sun Group. Last month, the Tribune Co. began offering buyouts to union and non-union employees with 10 years of service or more. Already several community journalists have opted to take the buy-out, leading a reporter at the Capital Gazette to note the “bittersweet” context of yesterday’s announcement of the union’s recognition.